I managed to put together 4 sets. The first two were done for the sneak preview, although it has taken me this long to take the photo and get it posted. 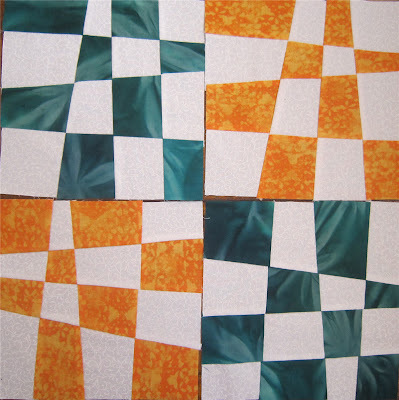 These blocks were fun once I worked out a good strategy for keeping the pieces together. It would have been disastrous if they were mixed up. 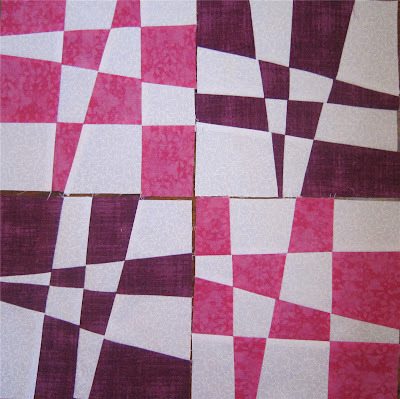 I accidentally cut a 9-patch with the purple blocks and had to add one more cut in the middle – this is why the middle two get so skinny. Still, it made for an interesting design. My little girl (7) wanted to have a go too, so here’s her 9-patch version and a close up of here hand quilting.